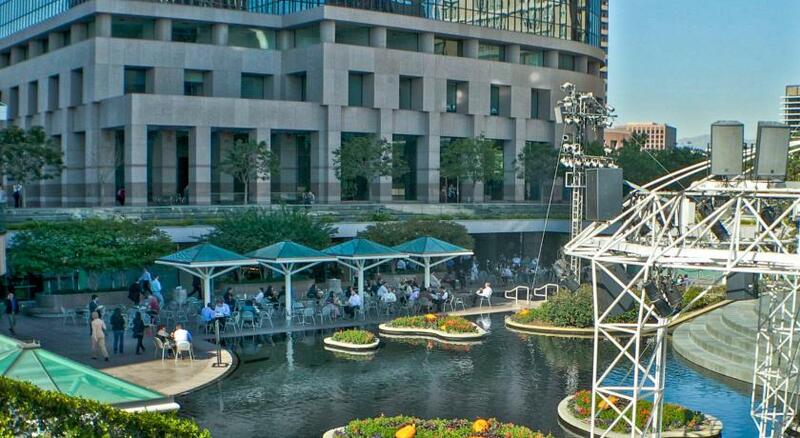 Lock in a great price for The LA Hotel Downtown – rated 8.2 by recent guests! Overall nice, very comfortable beds, the pump perfume into the elevators, weird at first, but nice. The food was rather perfunctory. The non-front desk staff were terrific. Front desk was a little stiff. Large, clean room and bathroom! Restaurant was delicious and were attentive to allergy concerns and extra requests. Beautiful hotel. All staff were friendly and professional! Pool was not busy. Fitness room was good with machines, weights, and mats. Short walk to restaurants and some shopping. The staff is welcoming and helpful. We appreciated that they held our luggage for us after checkout. The room was clean, comfortable and spacious. Beautifully detailed and modern hotel. Good and convenient location for downtown business and activities. Bed was comfortable. The staff was very friendly. I was there for a Biz Now event. This hotel was so nice! Beautiful view from the 8th floor and the pillows were extremely fluffy. Would definetely stay here again! Very Nice and the restaurant has a good breakfast buffet and store. The bed was very comfortable and the staff was friendly. The LA Hotel Downtown This rating is a reflection of how the property compares to the industry standard when it comes to price, facilities and services available. It's based on a self-evaluation by the property. Use this rating to help choose your stay! Offering an outdoor heated pool and 2 on-site restaurants, The LA Hotel Downtown features air-conditioned guest rooms, an on-site bar, and an on-site restaurant. The hotel is 1.1 mi from Staples Center. 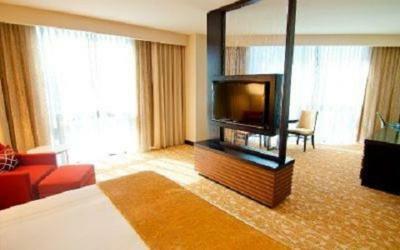 A flat-screen cable TV with pay-per-view channels is featured in each air-conditioned guest room at this hotel. All guest rooms include a desk, a seating area and a coffee machine. Featuring a bath or shower, private bathrooms also come with a hairdryer and free toiletries. Guests of this hotel can enjoy breakfast, lunch, or dinner at Ziran, which features a breakfast buffet with an omelet station. A bar menu and cocktails are available at BAR9, the Lobby Bar and Lounge, which is open late on Friday and Saturday nights. 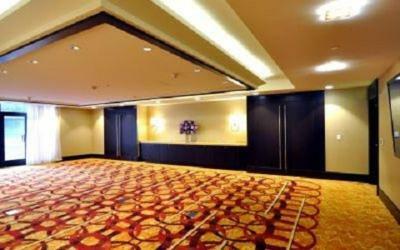 A 24-hour fitness center with cardiovascular equipment and weights is located at Hotel Downtown LA. Other facilities offered include a 24-hour state-of-the-art business center with Microsoft Windows and Apple Mac software, wireless Internet access and fax and photocopying services. There is also a gift shop at the property. This hotel is 7.3 mi from Sunset Strip and 5.8 mi from Hollywood Walk of Fame. Los Angeles International Airport is 11 mi away. When would you like to stay at The LA Hotel Downtown? This spacious air-conditioned room features a cable TV with pay-per-view channels, a work desk, a seating area, and a coffee machine. Offers an all stone bathroom with a hairdryer and free toiletries. 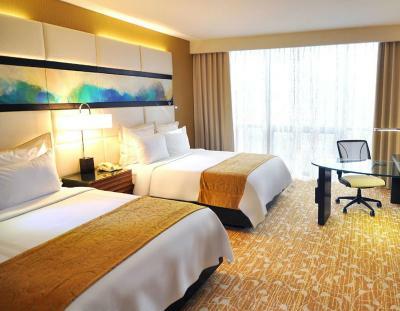 This room features a 40" flat-screen TV, floor-to-ceiling windows, a mini refrigerator, and a coffee maker. House Rules The LA Hotel Downtown takes special requests – add in the next step! The LA Hotel Downtown accepts these cards and reserves the right to temporarily hold an amount prior to arrival. It's ridiculous that any property expects you to pay for WiFi these days, I mean really? 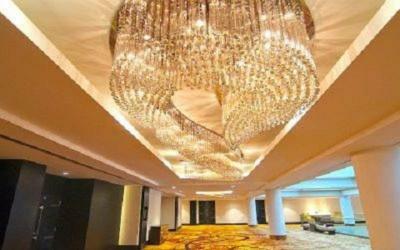 It's a property that reminds one of a "vegas" hotel, tries a little too hard to be "fancy." Very expensive! There was a charge for WiFi and you only could use it in the Lobby! Breakfast was not included. Parking not available. I did not read the fine print and apparently WiFi was not included in my non-refundable room rate. The beds and pillows were great. Very busy street if you missed entrance took lots of effort to swing back around. Traffic was awful! Beautiful hotel! I would def recommend staying here! The door in the shower was about to fall off, we alarmed the reception about the issue ,but during the 4 night stay no action was taken. Felt not safe while taking a shower, having that heavy glass door falling on you wouldn't be a joke, especially the kid. What took us on surprise- there was no free WiFi in the room. We didn't check this before in the description, assuming its not an extra for a 4 star hotel those days. The rooms were clean and comfortable for a Family of 3. Location- right in the down town. The double room was 2 double beds, not queen sized. Only free WiFi was in the lobby of the hotel and I was never able to connect to it. The policy of charging $10 a night for in room wifi is badly outdated and irksome. The restaurant, based on the one lunch we had is poor and over-priced. Poorly prepared food. Dirty plate. I asked for a glass of zinfindel and was served a rose, but was not charged. Location of my room was noisy due to being near generator or other hotel machinery, plus, street noise which can be expected. Lighting in bathroom is too dim, especially for makeup application. I liked the decor and that it was quiet. Paying for hotel wifi is a drag in this day and age. Nice modern room with a view looking out towards the Westin Bonaventure. Staff where great. Stayed 2 nights. About 10 minutes walk from Civic Centre metro station. and shares footbridge with Westin Bonnaventre via the world trade building. A fun stay downtown!